My buddy’s daughter commented on the fact that TJT doesn’t sound like an eighties album. I found this strange because it is firmly rooted in that decade for me. I replied saying that it was because she was young (mid-twenties). But she said no, there were a lot of albums that had the eighties sound and TJT didn’t have it. Evidently that sound has been very popular with Millenials, but what do I know? I’m about as Millenial as a VCR (what?). However, her comment did get me thinking about what the band was trying to do at the time. I’ve been rereading old Rolling Stone magazines and there is an interview with Bono where he grouses about eighties music—rock stars in particular. He saw the coolness by fellow musicians as a kind of detachment and something he and his band mates loathed. For all the criticism they received, detachment was not one of them. Their earnestness and seriousness was what drove much of their music. And it was what connected them with their fans. These guys believed in things very strongly and weren’t afraid to let the world know. Bono also complained about the commercialism of music. He felt that there are record companies “who treat music like a tin of beans—a product to be sold.” It could be said that this was ironic coming from the lead singer of one of the biggest bands in the world at the time. But what I think he as getting at was that U2 endeavored mightily against the notion of being mediocre, though commercially prosperous. They were not content with treading over familiar ground—even though it was lucrative and praiseworthy—simply because it successful. In the interview, there is a sense that the band’s superstardom is not necessarily something to reject but to understand that with that position comes a responsibility to the music and the fans. And this is where I think they took the road not taken. I can’t think of another band from that time that sang more about social and political issues than them (although I did not understand much if it). Songs like Sunday Bloody Sunday and Pride (In the Name of Love) had gravitas. The Police had gravitas, but I always felt they were more literary than political. Sting was political. But it was the subject matter of U2’s songs combined with their music that made them so different. 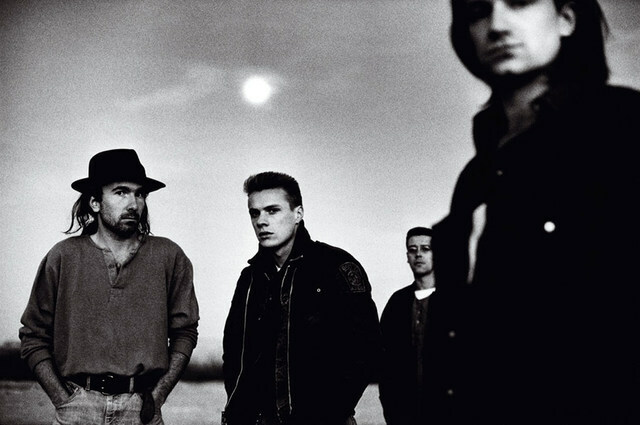 In the DVD Classic Albums – The Joshua Tree, Edge recalls that they felt very disconnected with what was going on in music at the time, even their music videos were “so different, like they were from some other place”. And though I relate all those songs with the eighties, it is because I listened to them so much during that time. But to someone like my buddy’s daughter, she doesn’t get that eighties-feel like she does from Def Leppard, INXS or Bon Jovi. I remember the first time I saw the Where The Streets Have No Name music video on television. The band set up on the rooftop of a liquor store in downtown Los Angeles and played to a captivated and growing crowd. The part that really struck me was there was a moment when the crowd was still respectful and stayed on the sidewalk while the police tried to keep order. And then—all of a sudden—they run into the street seemingly oblivious to the traffic. I thought how cool would it have been to be there. And in my new-to-rock naiveté, I realized this band was going to be huge. Even watching the video now, there is this sense that this very event was marking a significant change in the growth of the band. They were going to be megastars from that moment on. After all of the hype surrounding the new album and immense anticipation, the band launched the release with the force of a supernova. Streets raced up charts all around the planet. For a moment, everyone was playing U2 on the radio. 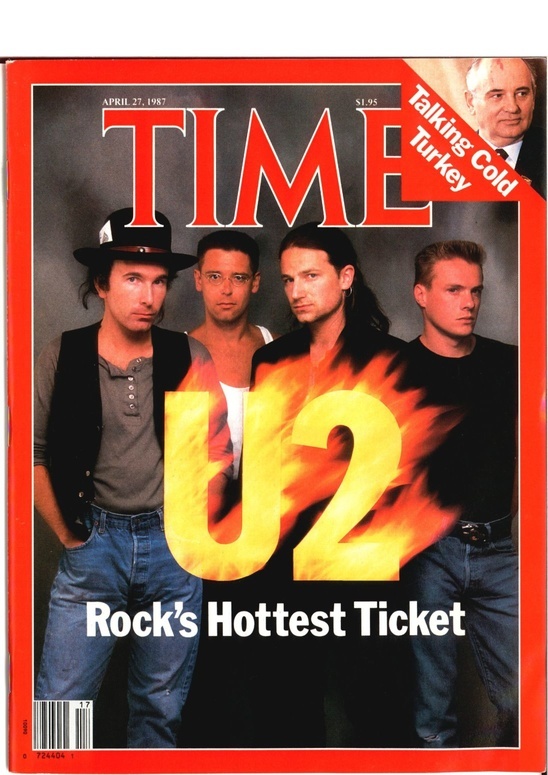 They were, as the April 27th issue of Time Magazine stated on the cover, “Rock’s Hottest Ticket”. What nearly all of us can agree on is the sound. The moment I hear the beginning of Where The Streets Have No Name, I Still Haven’t Found What I’m Looking For and With Or Without You, I know what it is. These songs are recognizable for their towering vocals and soaring guitars. They are the gold standard for bringing-the-house-down noise that only the best bands can produce. When I first listened to the album what knocked me off my feet was the open, ambient nature of the songs. There was something sweeping and spacious about them. I visualized the band playing atop a barren mesa beneath a domed night sky. But there was also this strangeness that was a part of every song. It was a little hard to express other than the album felt otherworldly and unlike the times. If that is what my buddy’s daughter meant, I agree. I have so many memories from that time it is hard to separate the album from the decade. I needed to step out of my own experience to see her point. 1987 was such a momentous time for the band. The culmination of their efforts was put to test to the country that held their fascination. It was a big album by a big band on a very big stage. And we here in the United States ate it up. It was the album of the eighties that didn’t sound like it came from there. Happy Birthday, TJT! You have brought so much happiness to us for the last three decades. It is embarrassing with what has happened to my memory in the past thirty years. I had forgotten how big The Joshua Tree truly was. It was huge. 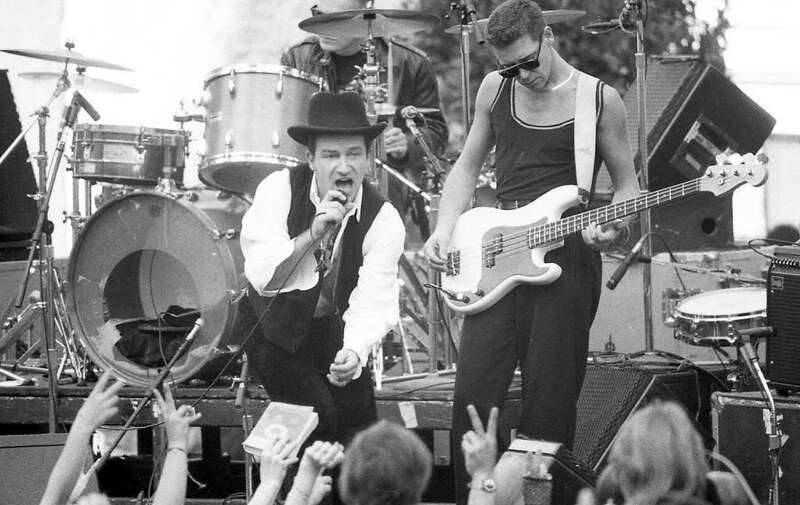 Following The Unforgettable Fire Tour (’84 – ’85) and The Conspiracy of Hope Tour (’86) droves of fans and the media were anticipating what the band had in store for its next album. I’ve been rereading some of my U2 books about that time and I had simply forgotten how much buzz there was about their new album. This was before social media or even the Internet. Where fans and music lovers alike got their news was from…the news. Rolling Stone magazine provided news about the band. MTV had a news segment. Radio stations would talk about where the band was in recording process. In The Joshua Tree section of my copy of The Best of Propaganda, the band’s official magazine, they were interviewed in the weeks before the album’s release. It has been nearly fifteen years since I read the book and I forgot that the original name of the album was The Two Americas. The band had spent several months touring the United States for their last album and seen much more of the country than ever before. The title was a reflection on their experiences with the sharp differences between the rich and the poor. 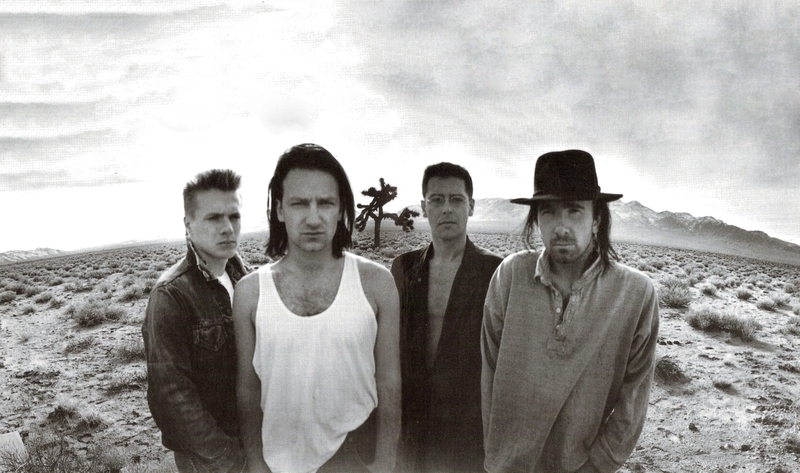 While that would have been a great title for the album, there is no doubt that The Joshua Tree was and still is the better choice. 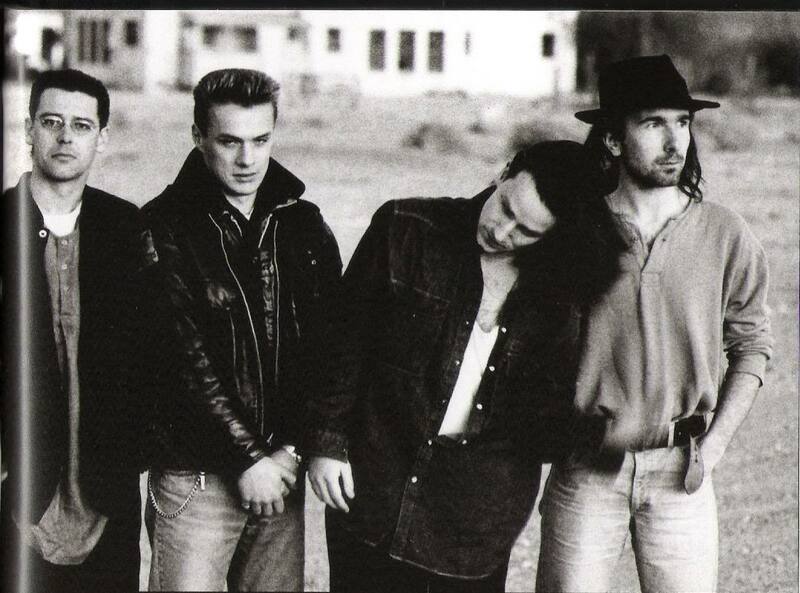 What I didn’t know at the time was that their photographer Anton Corbijn had suggested that they travel to Joshua Tree National Park in southeastern California to shoot some pictures for the album cover and sleeve. Corbijn drew his inspiration from the new music. His idea was that the stark landscape of the desert matched the sound the band had been writing and recording. This was also the when the United States and the Soviet Union were building up their nuclear arsenals and the rest of the world watched nervous anticipation as our two countries were careening towards an all-out conflict. The tensions that were so high between our two countries have slowly subsided since the eighties, but have recently surged. Bono was critical of the Reagan Administration and its involvement in Central America. In fact, Bullet in the Blue Sky, Mothers of the Disappeared and Exit were all commentaries about U.S. action in the region. I was in high school and did not know it at the time. We had kids in my class who were politically inclined and knew about all of this. I was not one of them. In fact, I wasn’t really aware of anything going on in the world, either politically or socially. I have a vague memory us talking about the arms race in my U.S. History class, but as I mentioned in a previous post, I was failing early every class. It was a time when Bono began speaking more about this during their shows. I was too naïve back to fully understand why he was doing it. It turned out that it had much to do with growing up in Dublin and watching as tensions between Northern Ireland and Britain were increasing. I realize now that when you are around the anger, hostility and outright violence in your hometown, you become more sensitive to it when you are traveling around the world. So there were all these conflicts between the U.S. and the U.S.S.R., in Latin America and the Middle East. The whole world seemed eager to fight itself. It was during these times when the album came out. The anticipation was huge and it was one of the first albums that went on sale one minute after midnight at record stores. For me that was astonishing. Did the labels and stores seriously think that they would attract anyone at that time? And would it have been better than simply opening at the normal time? This is the reason why I am not in the music business; I do not know anything. The fact of the matter was the midnight-release of the new album was pure genius. To have the media show fans waiting in long lines to be the first the get their hands on one is a brilliant marketing move. First, it shows that there are thousands of people all around the world willing to stay up late and stand “in the queue”. This coverage did not cost the label. All they had to do was put out a press release the public. The media would cover this for free. Second, it also planted in fans minds that, Hey the store near me might run out of records before tomorrow morning, so maybe I should get in line, too, which only made the lines longer. As I mentioned earlier, this was pure genius. Once again this was before smartphones, social media, the Internet and even personal computers (yeah, PCs were around, nothing like today). Yet still, during those primitive times, people found out. MTV, Rolling Stone Magazine, local radio stations were where we learned about the band. For those who were too young to remember or not even born, this was more than enough. It might be hard to imagine (to those younger than me) how they were able to reach so many so quickly, I would simply say what has always been said about this kind of information: good news travels fast. In a way those days were better. There was something special about buying a record album, cassette tape or compact disc. The album was big and had large images of the band. Sliding the record out of its sleeve and seeing that black, grooved slice of vinyl was like discovering an artifact. As great as it is to download an album onto the computer from the comfort of home, it’s just not the same thing. I love technology, but it can’t always replace the joy of certain things. Getting back to the album, for the hardy folks who stood out in the chilly—and sometimes rainy—weather and were willing to lose sleep to be able to listen to the album, I commend you. I didn’t. As I mentioned in previous posts (When I Became a Fan) I didn’t buy it immediately. I discovered it only after it was receiving heavy airplay. And it was because if that, that I bought my first U2 album. But I did know about the big midnight release and I did sense that something was happening to the band, something big. The buzz was everywhere and it got louder with each passing week. Even with my very limited teenaged awareness, I realized that they were a band on the run. Taking into consideration all the hype, rumors and prognostications, how could it ever live to up that kind of expectation? History tells us that it did, of course. But how did the band capture lightning in a bottle? 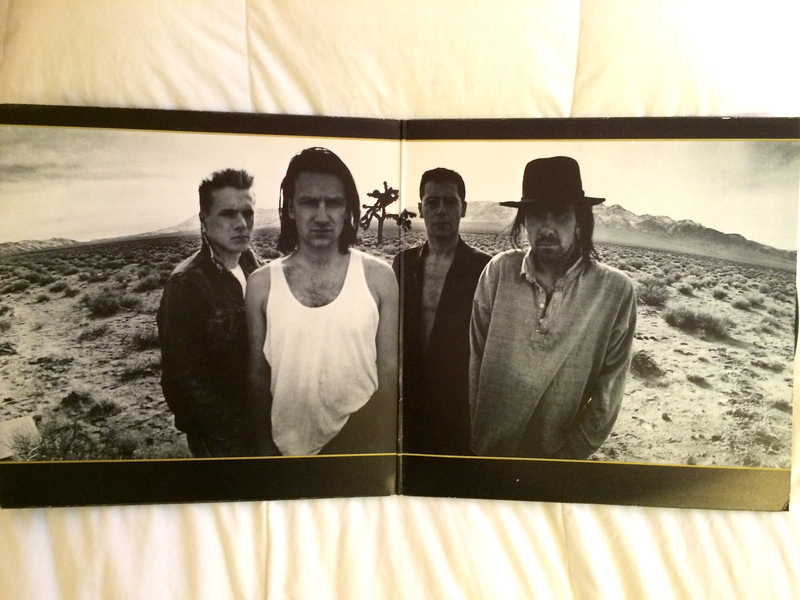 In my next post, I will attempt to break down the success of The Joshua Tree. I was talking with a buddy at my gym and gushing about the upcoming Joshua Tree 2017 Tour. He is not a fan but knew that I was. In addition, he is nearly ten years younger than me. I mentioned that that album propelled them into the ionosphere. Songs like Where the Streets Have No Name and With or Without You and I Still Haven’t Found What I’m Looking For were what produced the album’s huge success. I finished my spiel by stating that these songs were classics. To which he replied, are they or are they just old? There times when I have been myopic about the band’s music, mostly when I was younger. And I admit that I bristle whenever someone criticizes the band, but less now than before. Yet I was still surprised that he asked that. My response was, of course they are. But was that just the fan in me talking? I was fully prepared to launch into a dissertation on why those songs are, but did not have the time to explain in the gym setting. But it got me thinking about what made me believe that they were. There are many ways to define a classic and folks far more knowledgeable than me may have a better set of criteria, but here goes. First and foremost, the songs had to have stood the test of time. They have to be listened to and enjoyed by the original generation—in this case Gen X—and the generations that followed. And they have to be remembered. There are many songs that were big hits of a particular time, but literally forgotten in the years that followed. The songs that I mentioned have stayed in the public’s memory banks. Longevity is what helps a song achieve classic status. Second is impact. The songs had to have an influence culturally and critically and it had to have been widespread. The success of the album in sales, airplay, music awards and tour attendance clearly demonstrated its appeal around the world. They are still recognized today for their effect on the original generation of fans, artists, critics and the ones that followed. Third is representation. The songs must be illustrative of the time, like the eighties. There are so many songs that are classic eighties songs, and these are definitely at the top. Major music publications such as Rolling Stone Magazine, Spin Magazine and Q Magazine have attested to album’s relevance, so this is not just my opinion. Fourth is quality. Simply put, how good are these songs? I would say that they are great and so have music fans, successful musicians and respected critics. It is difficult to get so many to agree on something. So, an achievement like that can only result from that thing being good. Combined, these elements are what warrant giving a song (or songs) classic status. These helped solidify than band’s place in the rock pantheon. Regarding my buddy at the gym, I simply supported my opinion by turning to a couple other gym buddies and asked if these songs were classic, to which each responded yes. I told him if he asked around he would get more yeses than nos. It wasn’t convincing win, but I could see he was thinking about it. I showed my mom how grateful I was by actually helping her clean the house. It was one of those rare occasions where I actually did something without being asked several times. I already mentioned that I wasn’t doing well in school; I also wasn’t so great around the house. But she let me help without pointing that fact out. Moms can be cool like that, sometimes. RJ swung by my house around one o’clock (I was the last to be picked up) and we headed over to Oakland. Joshua Tree was playing on the tape deck in his car. It was a warm, cloudless afternoon with no wind as we drove across the Bay Bridge. Our friends Cecca and Julie were sitting in the back seat and singing along and I kept thinking, I can’t believe I’m going to a U2 concert. Perfect moments. There aren’t enough of them in life, are there? Although we had reserved seating, RJ wanted to get there early so that we had enough time to buy a concert tee shirt. Back then, certain bands would do this cool thing with their concert tees. You could only get the real tee at the concert. The real tee had all of the tour stops on the back. I remember seeing a Joshua Tree Tour ’87-’88 tee in Tower Records long after the tour ended. There was no itinerary on the back. Back to the show. We pulled into the parking lot of Oakland Coliseum about a half-hour later and five dollars for parking (yeah, that’s right). We all chipped so RJ didn’t have to pay. I had never been to the Coliseum before and had no idea what to expect. I did not expect to see so many vendors selling all kinds of merchandise. Concert tees were ten dollars and the lines were very long. I was determined to have a memento of the show and told our group that I wanted to get one before it started. They were all in agreement and waited with me; RJ got one as well. What surprised me the most was to see so many people smoking regular cigarettes, clove cigarettes and marijuana. It’s not that I was strait-laced, but there were so many cops around. It didn’t seem like the ones smoking weed were even concerned about getting caught. I kept thinking they were all so daring. How can you not be worried about being caught? To continue, RJ and I bought our shirts and we headed to our seats. We were in the very Upper Reserve section. There is another term for that: The Nosebleed Section. For those who have never heard of that term, the thought was that the air was so thin up there your nose would bleed. It didn’t matter because I would have gladly listened from the men’s room. The show was sold out and we had seats. As we made our way to our section, I could hear some stagehands doing sound checks on the equipment. Let me state that The BoDeans opened for U2 (followed by The Pretenders) and it was The BoDeans equipment that was being tested. When one of them began strumming on a bass guitar, it reverberated throughout the Coliseum. The sound was literally booming. I was surprised at how loud it was. We got to our seats and sat down, watching the crowd stream in from all around. Since we arrived early there was no one seated around us, but we also knew that would change very quickly. RJ lit a cigarette and held out the pack so each of us could take one. I looked around for the security guards, who were everywhere, but didn’t seem to notice or care that so many were smoking. Cecca and Julie didn’t seem to be too worried either. I was the only one who was concerned that four teenagers were going to get caught smoking in a non-smoking event and get kicked out. Again, this was my first rock show and I didn’t know anything. He wanted to buy four 7-Ups. My friend Cecca brought a hairspray bottle filled with whiskey she took from her dad’s liquor cabinet. She snuck it her purse and I was sure the guards who were checking people’s bags were going to confiscate it. All they had to do was smell what was in the bottle. But they didn’t. At this point it was probably safe to assume that the security staff really weren’t anything to brag about. The plan was to be sipping on Seagram’s Seven Crown and 7-Up (Seven and Seven for the unenlightened) at our seats. Mission accomplished. I am going to skip talking about The BoDeans and The Pretenders. Both put on a great show and I was surprised how good Chrissie Hynde sounded live. However, it was U2 we came to see and they did not disappoint. Everyone leapt to their feet as soon as the house lights dimmed. The band took the stage to roaring crowd. It was so loud that it sounded like one continuous tone. The show hadn’t even started and I felt like I was going to pop from the sensory overload. Bono stepped to the microphone shouted, “San Francisco!” Everyone threw their hands in the air and howled as the Edge began to strum the beginning of Where The Streets Have No Name. I cheered at the top of my lungs. Suddenly lights as bright as the sun shined from the stage and Bono launched into song. All sights, sounds, even the pounding of Larry’s drums in my chest was nearly too much and wonderful at the same time. 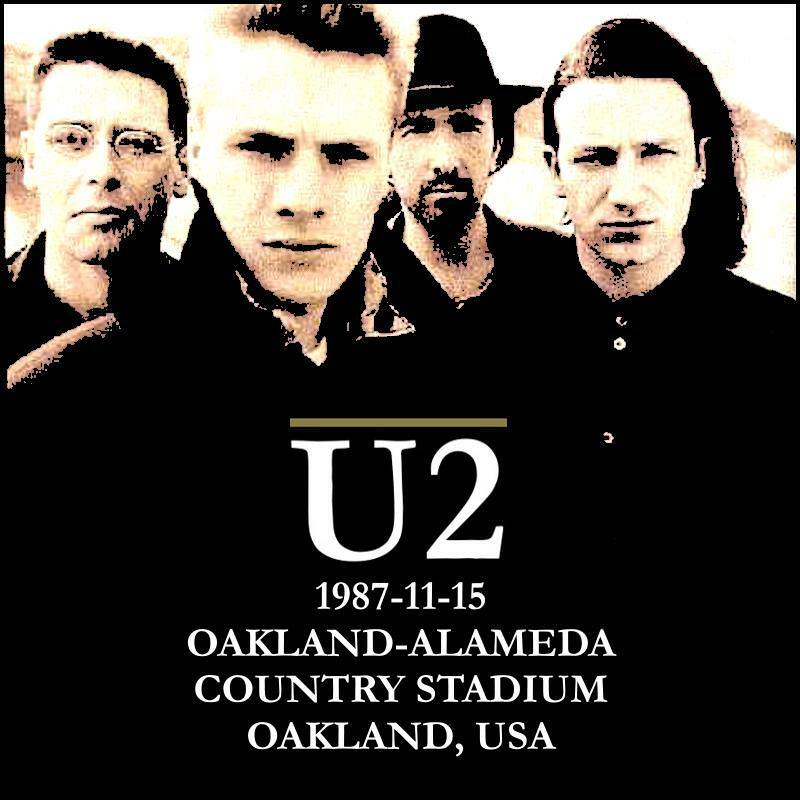 For me, there is no better U2 song heard live than Where The Streets Have No Name. I think the long beginning gives you a sense of ascent and by time Edge’s guitar comes in, followed by the rhythm section, you are flying. Add to that the flashing lights above and around the stage and the experience was unlike anything I had ever seen before. I sang aloud and didn’t care that I was off-key. Cecca wrapped her arms around my waist and held me so tight. The past few days were a surge towards this song and I just let it fill me up. It was like a waterfall of sound that poured right into me. I closed my eyes and let it wash the grief and sadness out of me, even if it was only for a short time. It felt like I was being purified of all of the melancholy in my body. I have heard people say that going to a particular concert was a “religious experience”. I think what they meant was that they encountered some kind of epiphany and that I understood. That show was a baptism, although I feel a little guilty saying that as a lapsed-Catholic. But it did feel like I was being admitted into a body that shared a common interest. That night I became fan. To be perfectly candid, it wasn’t as though I recovered completely overnight. I still had my bad days, but there were good ones, too. In addition, it wasn’t the music that saved me from a foreseeable decline; my family and friends did that. Instead, it was the music that I turned to when I was alone and wanted to feel better. There were days when the pain and loneliness were more than I could have ever imagined. And there were days when the joy and comfort from loved ones were more than I deserved. Over time, I got over it. I grew up and learned how to deal with loss. The happy days eventually outnumbered the sad ones. U2’s music stayed with me from that time on. Finally, I am thankful for the things that I learned from that time. That solace can come from simple things like listening to a record album. Happiness can be singing along to it with friends as I drove down a stretch of open highway. The best of all, I was surrounded by people who loved me. 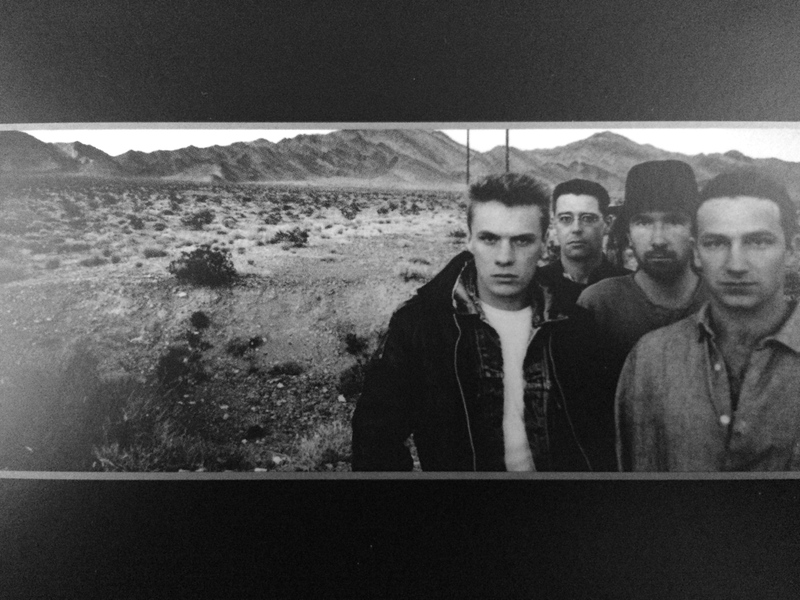 And during those tough few years when I was young and still innocent, The Joshua Tree was the soundtrack of my life.